We are at Week 5 of our study Mastering the Art of Contentment. This week on the Morning Prayer Calls we will discuss the importance of prioritizing. In fact, your contentment is tied to your willingness to prioritize. In a society where being busy is viewed as a badge of honor it’s difficult to not buy into the lie that we can do it ALL. Guess what? You can’t do it all; some things will have to be left undone or left to be done by someone else. I am reading a book by John Maxwell titled, “Today Matters.” He writes, “If you want to be a success focused concentration is the key.” The Bible echoes this truth: “This Book of the Law shall not depart from your mouth, but you shall meditate in it day and night, that you may observe to do according to all that is written in it. For then you will make your way prosperous, and then you will have good success” (Joshua 1:8). 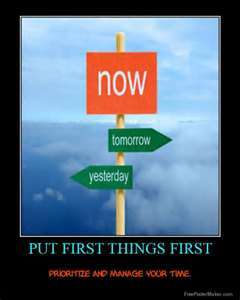 Are you making the most of today or are you squandering it by ruminating on the past or dwelling in the future? My friend today is all you get; tomorrow is not promised. Embracing this truth empowers me to say “no” to those things that aren’t part of God’s plan for me. I’ve learned the hard way that not every good idea is a God idea therefore, I pray about each and every opportunity that comes along and ask God to close the door on what doesn’t originate from Him. If you knew you had 1 year to live, would you spend your time the way your are spending it today? More to come on the Morning Prayer Call. Join us and invite your friends and family to be part of this powerful time of prayer and reflection! Ready to embrace surrender as a lifestyle? Join us for the first session of a 3-part seminar series, “Surrender Your Personality.” I am teaming up with Karen Ward, Certified Personality Trainer on April 20, 1-4pm. There’s still time to catch Early Bird Pricing! How awesome is this… I’m actually reading Today Matters as well. Crazy but I’m not surprised. I was just going through my blogs I follow After finishing a blog post that will come out this week where I mention reading Today Matters and another book from Joyce Meyer. I’m going to take this as confirmation that I am indeed on the right track. Sending you a big hug Dr. Celeste! Ok will do. I’m just on ch. 2 but it has already been life changing for me in how I view my ‘today’ each day.